Nice, some composite insect. Perhaps could have been a little darker. WHO KNEW VXL ARE BETTER THAN SHPS? Can anyone port it over into ORA? Curious as to what the improved VXL-render will make this look like. should help getting the shadow and sections rendered better. The normals on the legs seem to be mirrored/wrong. On the left/right facing one, the legs have the opposite side lit. In fact, Spider has 8 legs, but this one resembling me to Head-Reversed mosquito with its larger legs and a single smaller scorpion tail. 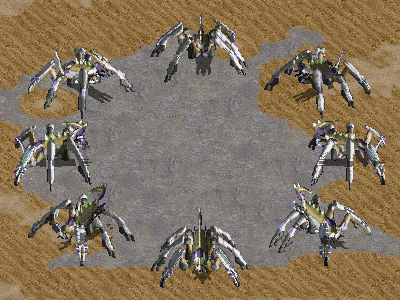 If I want to use it, I use as Yuri's Campaign unit as Scropius, describe as large bizarre insect-like mech which emits virus laser called "Chlorotoxus"
Agreed, doesn't look very "Yuri" to me, especially with the bright metal on the legs.